Educational inequity, mass incarceration and climate injustice are interconnected problems and Sacred Generations is building the power of sovereign solutions to drive transformative systems change. The winners of Fast Company’s 2019 World Changing Ideas Awards were announced today, honoring businesses, policies, projects, and concepts that offer innovative solutions to the issues facing humanity. All of the finalists are highlighted in the May issue of the print magazine, which hits newsstands April 16. Fast Company’s May issue celebrates these world changing ideas, highlighting Sacred Vote as a groundbreaking advocacy tool designed to educate and heal voters in Native California. Sacred Vote was selected as a finalist in the Social Justice category and an honorable mention in the Experimental and General Excellence categories. 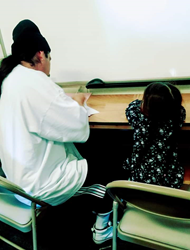 As an innovative voter education model, Sacred Vote amplified Native movement building by asking all candidates on the ballot to publicly share their solidarity with sovereign tribal communities through a set of six targeted questions addressing tribal relationships, sovereignty and movements. Specifically, candidates were asked to address the issues of educational inequity, mass incarceration and climate injustice. Sacred Vote is building sovereign civic leadership pathways for system-impacted tribal communities to restore Native land and people. About Sacred Vote: In two weeks, Sacred Vote attracted more than 1,000 voters and more than half reported to be first time voters. In addition, one hundred percent of voters said they were more knowledgeable about Native voting rights, prepared to make an informed vote and empowered in the voting process. More than 100 local, statewide, federal and judicial candidates were reported to have participated in this questionnaire. Voters heavily represented the Yurok, Hupa, Maidu, Miwok, Yokuts, Pomo, Ohlone, Chumash, Tataviam, and Cahuilla territories. Because of this work, never again will candidates be able to run for public office in the state with the largest Native population in the nation without publicly sharing their solidarity with Native peoples and movements. Native young people now live in a world where they know how elected leaders stand with Native movements - and they have an advocacy tool to hold them accountable, if and when they're elected. About Sacred Generations: Sacred Vote is a project of Sacred Generations. Founded a year ago, Sacred Generations is a Native-led movement of medicine organizing system-impacted tribal communities to end educational inequity, mass incarceration and climate injustice in Native California and beyond. Awarded the Echoing Green Global fellowship in 2018, the founders are driven by the guidance of Shoshone sisters Mary and Carrie Dann when they said, “We can't stop the violence against our communities until we stop the violence against Mother Earth because what drives the violence against Mother Earth is the same thing that drives violence against our communities.” The founders personal proximity to pain and power as system-impacted Indigenous peoples of this stolen land brought them together to protect sovereign nations and #HonorTheSacred. Educational inequity, mass incarceration and climate injustice are interconnected problems and Sacred Generations is building the power of sovereign solutions to drive transformative systems change.